Origin and Habitat: Echinopsis saltensis subsp. schreiteri is found in the area between Tucuman and Salta in north-western Argentina. Echinopsis saltensis var. nealeana (Backeb.) J.G.Lamb. Echinopsis saltensis var. pseudocachensis (Backeb.) J.G.Lamb. 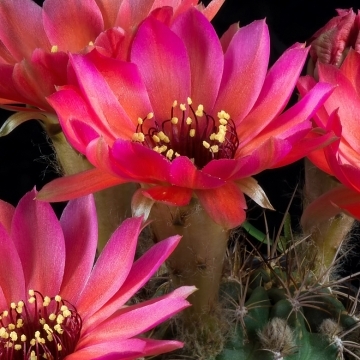 Lobivia emmae var. brevispina Backeb. Lobivia pseudocachensis var. cinnabarina Backeb. Lobivia pseudocachensis var. sanguinea Backeb. Description: Echinopsis saltensis subsp. schreiteri (A.Cast.) 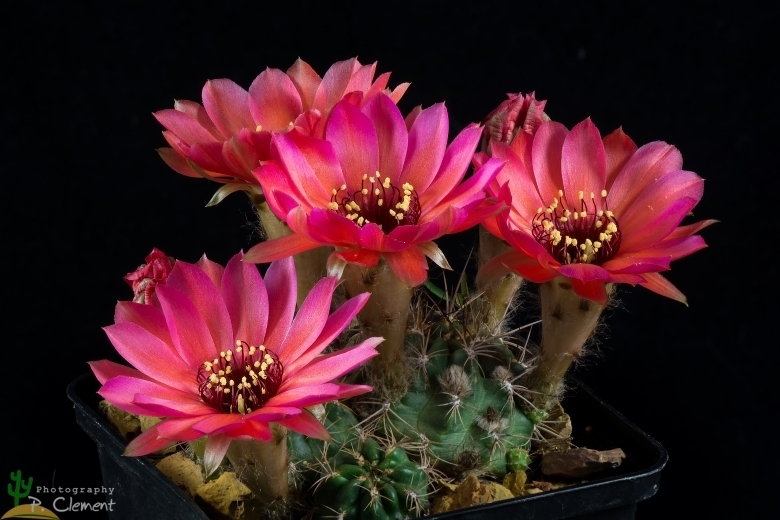 M.Lowry , better known as Lobivia schreiteri, is a common attractive dwarf cactus and particularly is fun as it matures and flowers at an early age. This is a variable species, that has received several of unnecessary names, none deserving acceptance as shown by field studies (like many other cacti) and comprises slightly different regional or morphological forms as well as various cryptic allied species. But where each form is linked to others by populations of plants with intermediate characteristics. E. saltensis subsp. 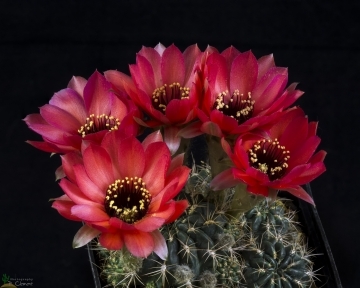 schreiteri is a small-growing cactus with small clustering stems, deep-rooted, and partially buried in the ground. It form dense clusters or mats up to 30 cm wide and less than 3.5 cm tall (more in cultivation). The short-tubed flowers, about 3 cm long, are striped with bright red and purple and have reddish purple stamens. Derivation of specific name: The epithet honours the Argentinian botanist R. Schreiter (fl. 1927). Root: Taproots large and woody. Stems: Individual stems, globose to elongate, dark green or bluish green, 1.5-3 cm in diameter and up to 3.5 cm tall. Apex depressed, woolly. Ribs: 9-14, continuous, rounded, and weakly sinuous. Areoles: Oval, whitish to grey, about 1.5 × 2.5 mm. Central spine: Usually absent, rarely one to 2 cm long. Radial spines: 6 to 8 fine, curving, spreading outward and upward, whitish, 0.5-1 cm long. Young spines light brown, becoming straw yellow. Flowers: On side of plants nearly at ground level, funnelform, purplish red with darker throats, to 3(-4.5) cm long and 3(-3.8) cm in diameter. Pericarpel 5 mm long. Tube 1.5 cm long, bright green outside with loosely hairy elongated scales with a slightly brownish tip. Wool white mixed with a little black. Outer perianth-segments orange-red with a olive green central line. Inner-perianth-segments spatulated, red and purple, tip sharp mucronate. Throat blackish purple. Stamens in two series with reddish purple or violet filaments. Anthers light yellow. Style and stigmas yellowish green. Echinopsis saltensis Speg. : (subsp. saltensis) Plants with relatively short petals and dark-coloured Stamens. Origin between Tucuman and Salta ( from Alemania to close to Cafayate). Echinopsis saltensis var. nealeana (Backeb.) J.G.Lamb. : This plant has usually somewhat larger solitary body than the near var. pseudocachensis, sometimes also with long, curved Central-spines, the red blooms are more spread and rarely yellow too. The fruit and seed are similar to those of the other Varieties. Echinopsis saltensis var. pseudocachensis (Backeb.) J.G.Lamb. : Only a few cm small, clumping green bodies, with a long carrot root. Ribs about 14 straight. The plants in this population are quite variable and comprises both individuals with long central spines and individuals with short radial spines without central (Respectively named Echinopsis saltensis var. emmae and Echinopsis saltensis var. emmae f. brevispina) The flower is 4-6 cm long and broad, light red to carmine coloured. The fruit and seed are similar to those of the other Varieties. Origin: Escoype. Echinopsis saltensis subs. schreiteri (A.Cast.) M.Lowry: has small deep-rooted, clustering stems. Flowers, short-tubed, red and purple to 3 cm long with sharp tipped petals and reddish purple stamens. Distribution: between Tucuman and Salta in north-western Argentina. Lobivia saltensis var. multicostata Rausch: The plant of this population are similar to Lobivia saltensis, however with 20 and more ribs, closer spaced areoles and therefore also closer, broom-like Spination. Flower and fruit are alike. Origin: Cuesta de Lajar. Lobivia saltensis var. zapallarensis Rausch: This is the smallest form from the Sierra Zapallar it has only 9-11 sharp-edged ribs, the epidermis is black-green, often also violet coloured with red to orange flowers, the fruit is more oval, however otherwise nearly like Lobivia saltensis. 9) Urs Eggli, Leonard E. Newton “Etymological Dictionary of Succulent Plant Names.” Springer, Berlin/Heidelberg 2010.